Makeup lovers can head into Hudson’s Bay Canada right now and pick up a great deal. For a limited time, purchase a minimum of $36.50 of your favourite Estee Lauder products and you could walk away with a free gift bag. You can choose from a selection of free gift bag options such as the Supreme Choice and Lip Choice Gift Bag, or Resilience Lift and Lip Choice Gift Bag that are valued at over $88. Each gift bag comes with a stylish Lisa Perry pouch with your favourite Estee Lauder products inside. In order to get your free gift, simply purchase at least $36.50 worth of Estee Lauder product, and then add the gift bag of your choice to your cart. Enjoy sample sizes of your favourite Estee Lauder creams, or some of your favourite Estee Lauder cosmetics with your free gift bag. This deal is on until March 15, 2015 or while supplies last. There is a limit of one gift bag per customer. For a limited time only, Hudson’s Bay is offering free shipping on cosmetics and fragrance orders over $29. 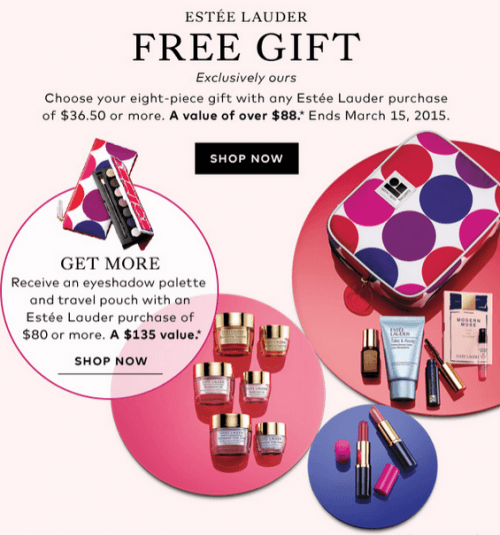 Click here to begin shopping for Estee Lauder products online at Hudson’s Bay Canada.